There is a clear connection between maternal obesity during pregnancy, risk of gestational diabetes and fetal macrosomia. Researchers in Brazil recently completed a study on the impact of visceral adipose tissue (VAT) depth in pregnancy as it relates to infant weight at birth. The study population was young, ranging from 10 to 19 years during pregnancy. Glucose tolerance test results in late pregnancy were also noted. The study was published in the Journal of Obstetrics and Gynaecology Canada. A total of 73 pregnant girls and teens were included in the study. 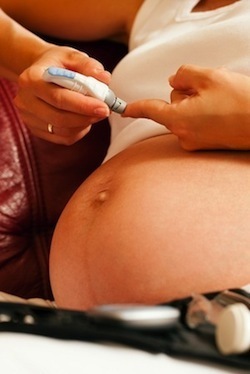 None of the girls were diagnosed with diabetes prior to pregnancy. VAT depth was measured twice during the pregnancy – 12 weeks and 20 weeks gestation. Results: Researchers found a clear parallel between VAT depth measured in the first half of the pregnancy and newborn weight. The connection better predicted newborn weight than maternal BMI. There was no connection between VAT depth and results of glucose tolerance testing. Source: Cisneiros RM, Dutra LP, Silveira FJ, Souza AR, Marques M, Amorim MM, Urquia ML, Ray JG, Alves JG. Visceral adiposity in the first half of pregnancy predicts newborn weight among adolescent mothers. J Obstet Gynaecol Can. 2013 Aug;35(8):704-9.